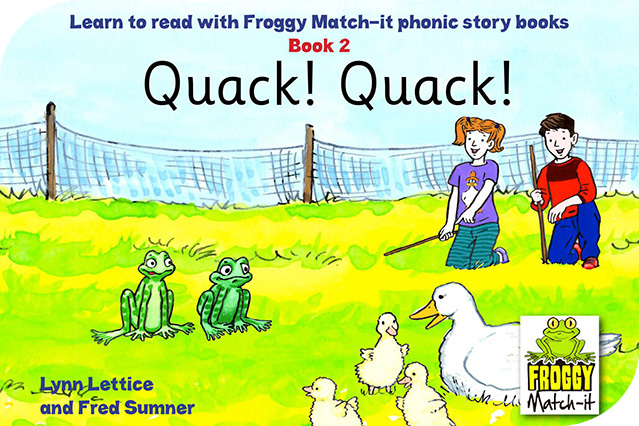 We are pleased to announce that our second e-reading book, Quack! Quack! is now available from Amazon for £1.99. This book, together with the first in series, Hop! Hop! Hop!, complement the Froggy Match-it phonic games app and feature the two frogs, Fred and Fran. In the first book, Hop! Hop! Hop!, the story follows the two friends as they encounter a rather hungry cat. In this second book, Fred and Fran make friends of the feathery kind. Quack! Quack! is a decodable e-reading book, where children can work out the words using their developing phonic knowledge. The Department for Education recommends that parents use decodable readers of this sort with their children, so that they can “work out new words from their letters and sounds, rather than just guessing”. The phonics words in this book are the sort that are used in level 2 of the Froggy Match-it game, available for Ipad and Android tablets. Any child successfully using the first two levels of the app will be able to work out almost all of the words in the story. Quack! Quack! is a stand-alone story book and can be used by any child learning to read and spell short words ending in double letters or containing sh and ch: words such as bell, kiss, duck and ship. So if your child is learning to read with phonics, why not try these two books? Teachers will find them extremely useful in the classroom and it will make parents smile to listen to their children really, properly reading.